Avdiivka Coke CEO: "After what we've been through, we do not have much to be afraid of"
Avdiivka Coke and Chemicals Plant (AKHZ) is the largest coke and chemical plant in Europe. Being under the umbrella of Metinvest Group majority-owned by Rinat Akhmetov, AKHZ is located in Donetsk Oblast, just a few miles from the contact line. During the years of war in the east of Ukraine, over 300 shells have landed on the territory of the plant, 12 workers have been killed, with two of them hit directly at their workplace. AKHZ has faced almost complete shut-down 15 times and some of its ovens have been mothballed over thirty months. However, last year the company did not only maintain the coke production, but also doubled its output. In an exclusive interview with Radio Liberty AKHZ CEO Musa Magomedov stated that AKHZ managed to achieve this despite the intense situation and the trade ban with the non-government controlled areas. - Mr Magomedov, how was the plant operating in 2018? - It was actually a good year, as we finally restored the use of the last battery. Still, we did not manage to put all ovens back into operation. Right now, we have 35 out of 65 ovens in operation. Also 8 ovens are under overhaul and others are still waiting for their turn for capital repair. We need from six to twelve months to put them fully into operation. - How much coke does AKHZ currently produce per day? - We produce 9,300 tonnes of blast-furnace coke or 10,000 tonnes of bulk coke per day. This is even more than what we had at the pre-war time. Right now all our shops and all out structural units are operating. Today the plant employs 3,750 people, thus we have a slight shortage of staff. - Could you please explain how you have managed to reach the pre-war output levels despite the trade ban with the non-governmental areas? We know that before 2017 AKHZ received coal supplies from the mines of Metinvest Group that are located along the contact line. - Indeed, since the beginning of the blockade in Donbas, the plant has fully switched to American and Australian coal, as well as coal from the government-controlled areas. This is still the case. Due to problems with the logistics, it took us some time to go beyond 500 oven pushings per day. We had either problems with coke shipments or coal supplies. However, we have settled this issue now. - Has the blockade of the Kerch Strait influenced AKHZ operations? - If you mean our plant in particular, then the answer is no, it has not influenced our operations. The point is that coal from the United States and Australia comes through Odessa Sea Port. Still, the blockade of the passage has affected the production cost and competitiveness of other companies in the Group which used to receive cargoes via the port of Mariupol. - How has the cost of production changed now? - Our direct and main competitors in the market are the Russians. And we operate in a non-competitive environment compared with them. This is connected with logistics, delivery and stability. Since the beginning of the blockade in Donbas, the situation has not changed and the blockade of the passage in the Azov Sea has added to the problems. This affects both the competitiveness and the output. Still, we are not giving up! - In December 2018, the plant ignited an automatic gas flare stack also called Baikonur by locals. What does it mean for the plant? - This means that we are working to the full capacity right now. The flare went out when we had the first major shutdown of the plant as a result of military operations. And then we did not have it back, as the plant did not have any excess of coke gas. When the flare went out, I felt complete darkness. I was looking forward to the time when we could have it back, as it gives hope for the better future. 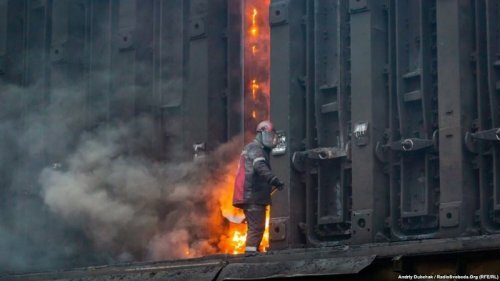 - Recently the plant has launched a new tube furnace for coal pitch heating, which is unique for Ukraine. Please tell us what the plant does to take care of its environmental footprint. - If we ignore environmental issues, we will be ultimately affected by them. That's why the key goal of coke battery overhauls is to ensure the oven impermeability to avoid gas penetration. The gas treatment principles for a tube furnace are different. The emissions are 90% down in comparison with the oven it has replaced. That's why I believe that it was the right decision to construct this furnace, both from the environmental and economic perspectives. Over the last five years, we have invested almost one billion hryvnias in total in modernisation and environmental programmes. - Huge conflict escalation in early 2017 revealed all weak points of Avdiivka infrastructure. First of all, we are talking about gas, electricity and water supply. Have you managed to solve these problems considering that they affect the production as well? - We have just one problem out of these three left, and this is water supply. We completed construction of two power lines in 2017 and the town does not experience any problems with the electricity any more. As for gas problem. It took some time to finish the construction of a gas pipe for Avdiivka, but the gas problem is not an issue any more. Water supply is the most important problem so far, both for the town and the plant. There is no quick solution to the problem. People receive water from Donetsk water purification station located at the contact line. This means that the problem will continue to exist as long as the military actions are in place. Look, it cost us almost the same money to construct the gas pipeline and the power line: UAH 34 million and UAH 33 million respectively. The water pipe may cost us as much as UAH 250 million. The most important issue here is how much time it will take us to construct it. - How do you assess the possibility of Donbas reintegration? - I still hope that a political decision will be found, the war in Donbas will end and Donetsk will be still a part of Ukraine. I really hope that people will be able to work there and get competitive salary, as it was before the war. And that we will have flights from Donetsk. I believe in this. However, there is less and less belief. Still, you can't live without it. If you do not believe everything becomes insignificant. - It is believed that 2019 will not be an easy year for Ukraine because of the presidential and parliamentary elections. Are you concerned that the political situation can affect the operation of AKHZ? - After what we have been through here in Avdiivka, we do not have much to be afraid of. Yes, we are facing the oncoming presidential and parliamentary elections and there will be changes. However, this is not as scary as the fact that the contact line goes through the town and the plant.